"My understanding is the ones with children have been dismissed," one U.S. Attorney said. EL PASO, Texas — Confusion reigned in the legal system Thursday as criminal cases against migrants with children did not proceed in two federal courts despite President Donald Trump's vow to continue prosecuting everyone arrested for illegal entry. One example of the mixed messaging: A spokesman for the U.S. Attorney in the Western District of Texas issued a statement saying that in light of Trump's executive order ending the separation of parents and children, his office "will dismiss all pending [illegal entry and re-entry] cases involving a parent who has been separated from a child" except for those with serious criminal histories. Less than an hour later, the spokesman, Daryl Fields, retracted the statement without explanation, saying he would provide "updated information as it becomes available." Sarah Isgur Flores, a spokeswoman for the Department of Justice, said there has been no change to the department's "zero-tolerance policy to prosecute adults who cross our border illegally instead of claiming asylum at any port of entry at the border." And U.S. Customs and Border Protection said in a statement that "the Border Patrol will continue to refer for prosecution adults who cross the border illegally. For those children still in Border Patrol custody, we are reuniting them with parents or legal guardians returned to Border Patrol custody following prosecution." But at the federal courthouse in El Paso, the proceedings showed that some parents were being treated differently than migrants who entered without children. Before an afternoon hearing, Assistant U.S. Attorney Shane Wagmen told four defense attorneys, "We already dismissed all the ones with children." "My understanding is the ones with children have been dismissed," Wagmen continued. "If someone in here has children, please let me know." A defense attorney noted she had one client, a mother, whose case had not been dismissed. Wagmen got on the phone to arrange for a written order of dismissal as the mother was brought into the courtroom. She shuffled across the floor in a blue county jail uniform, shackled at the ankles and waist. Then the judge entered, and the woman's case was dismissed orally in the courtroom while 11 men pleaded guilty. Meanwhile, in McAllen, Texas, authorities did not go ahead with criminal charges against 17 of 77 people accused of crossing the border illegally, citing their family status. "We were given a [list] of the people who would be presented. There were 77 people and then we got notice from Border Patrol that 17 of those people were being pulled from the [list] and they were heads of households," said Marjorie A. Meyers, a federal public defender for the Southern District of Texas. Carlos Moctezuma García, an attorney in McAllen who was in the courtroom, said all 17 were parents. "Each one of them, we talked to all 17, each one had their child taken away from them," García said. It is not clear if the migrant parents in either court would be brought back for prosecution later or if they would be deported without criminal charges. There was also uncertainty over how they will be reunited with their children. "There was not much reaction because the parents are worried," said Garcia, who described the mothers and fathers in McAllen as "distraught and confused." Zenén Jaimes Pérez, a spokesperson with the Texas Civil Rights Project, said the parents will find the process of trying to track down the children who were taken from them at border processing centers to be arduous. "They already had been separated for two to three days," said Jaimes, who is in McAllen, Texas. For about a month, the Trump administration has been carrying out a "zero tolerance" policy, trying to prosecute every person who crosses the border outside of official ports of entry, including those requesting asylum and who have their children with them. While it had not yet reached 100 percent prosecution of those charged with illegal entry, McAllen and other parts of the Texas border had seen a spike in prosecutions. 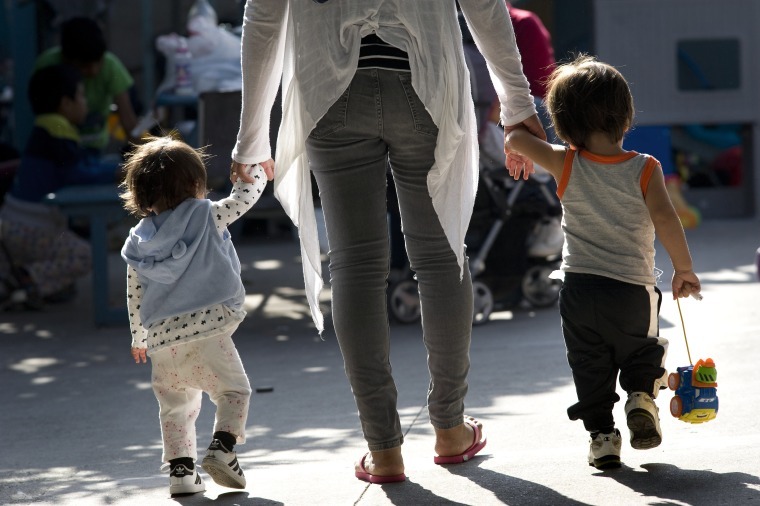 Children were separated from parents or guardians and taken into federal custody by the Office of Refugee Resettlement (ORR), part of the Department of Health and Human Services, while parents were taken into the custody of U.S. Marshals to await prosecution. On Wednesday, Trump bowed to intense pressure and signed an executive order ending the separation of children from parents at the border. But that order did not include directives on how to reunite parents with their children. Jaimes said since the prosecutions began, Texas Civil Rights Project has talked to 400 people in McAllen who have been separated from their children. The organization is trying to set all of them up with lawyers to help them find their children, turning to other advocacy organizations that provide legal services and firms that do such work pro bono. "We are digging deep, very deep," among allies, he said. In a surprise visit to the border, First Lady Melania Trump also seemed focused on reunification. At a shelter in McAllen where some immigrant children are housed, she asked how she could help the children reunite with their families "as quickly as possible."